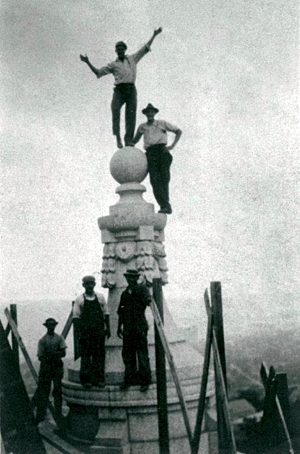 Cathedral workmen balance on one of the stone turrets ringing the dome in this 1913 photo. Courtesy the Cathedral of St. Paul. Local historian Larry Millett isn’t an expert on the Cathedral of St. Paul, but as a longtime researcher of the Twin Cities’ architectural landscape, he can’t help but run into it, he said. As anyone driving West on Interstate 94 into St. Paul knows, that domed building overlooking downtown “is pretty hard to ignore,” Millett said. The cathedral is sure to take center stage when Millett speaks on “The Churches of Emmanuel Masqueray” at 2:30 p.m. March 22 in the cathedral’s Hayden Hall. The presentation is part of the cathedral’s centennial celebration of its first Mass. In addition to the cathedral, the French-born architect designed about two dozen churches in the Midwest. Millett is the author of several architecturally focused books including “Once There Were Castles” (University of Minnesota Press, 2011), which includes the history of the Kittson Mansion, St. Paul’s most expensive house when it was built, razed in 1906 to make way for the cathedral. At the time of the cathedral’s commission, wealthy neighborhoods overlooked all sides of downtown St. Paul, but Summit Avenue was already a singular spot. It was home to the largest house in Minnesota at that time, that of James J. Hill, the railroad baron whose Catholic wife, Mary, as well as his business interests tied him to Archbishop John Ireland. Summit Avenue was rerouted to accommodate the cathedral’s construction. The cathedral is part of what Millett called the “age of heroic architecture” that marked the early 20th century due to the advent of steel — a stronger building material than wrought iron that made larger buildings possible?— and an interest in classical, monumental design and urban beautification. A late-1800s growth spurt in the Twin Cities’ population made them ripe for new construction and city planning. The cathedral was commissioned in 1905 while the Minnesota Capitol building, designed by St. Paul architect Cass Gilbert, was being finished. By the time the cathedral’s exterior was nearing completion, work was under way on St. Paul’s Union Station. Meanwhile, the Basilica of St. Mary was under way in Minneapolis, and the unprecedented feat of simultaneously building two cathedrals wows Millett because of the fundraising both projects required.